Be careful the cat! No say the cat is in the sack ,’ when you have not the cat in the sack! Be careful the cat! 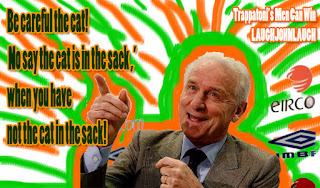 No say the cat is in the sack ,’when you have not the cat in the sack! So is it better to wait until it's perfect to sow seeds NO! Hey Boys n Gals... I am not saying I am like Gotye or anything so assumptive (I love THAT song !) but I do agree that POP needs to be more fun. In his video interview on CNN he said that "he was tired of talking about himself"
Exhibit A, B and C follow - roll on Fun city please.